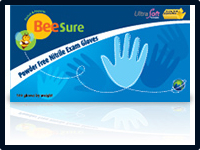 The gloves are regulated by the FDA to be Examination Grade gloves. Smooth polymer interior coating. Micro-textured surface, 200 micrograms/g water extractable protein. This makes them ideal for physicians, medical professionals, veterinarians and other specialized health care professionals who use gloves in large volumes. FIRST TOUCH™ enhanced. Zero skin contact manufacturing process. You can be sure that you are the first to the touch. Low protein-rated to minimize your exposure to allergen and irritants. Polymer coated for easy donning.